Tillers are great tools, but they're not toys by any means. Following proper safety instructions and operation tips will ensure you have a safe and productive experience with your rototiller. The cutting power necessary for these machines to break hard ground or cultivate loose soil is enough to do serious harm if not used properly. 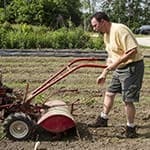 Put safety first, along with proper operation techniques, and you'll come to love and respect your garden tiller for the powerful tool that it is. Durable work boots with sturdy, textured soles for traction are highly recommended as the most important safety gear you should wear when operating a tiller. Your feet are the closest part of your body to the tines, which spin and cut the ground. 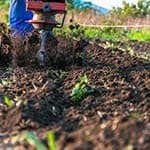 If you use a rear-tine tiller, your feet come very close to the tines, and should be very well guarded against injury. Close fitting clothing should also be worn during tiller operation. Loose clothing or jewelry can become entangled in the tines or other moving parts and cause serious injury. Also, full-length pants and long-sleeve shirts are recommended to protect your skin from any propelled debris. Work gloves should also be worn to improve your grip and protect your hands. 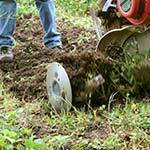 Prior to beginning your tilling project, you need to be sure you take a walk around the area where you'll be tilling. Inspect the area for any obstacles. Look for rocks, kids' toys, garden hoses, sticks, and anything else that could be launched by your tiller or cause damage to the tines. Removing these obstacles will also help prevent trip and fall accidents. Make sure no children or pets are present before you begin tilling. You don't want your dog getting hurt trying to attack the tiller, and you don't want kids running in front of you either. Be sure to always keep an eye out during operation to ensure no one enters your work space. Review all of your tiller's controls and be familiar with how to properly operate them. Make sure you're aware of any quick shutoff features, and know how to quickly shut down and disengage the rototiller in case of an emergency. When something unexpected happens, you have little to no time to think. You must be able to quickly and appropriately react to avoid accidents. If necessary, review your owner's manual prior to startup to make sure you're familiar with all of the shutoff controls. When you're ready to fire up your rototiller and get started, you should first make sure any clutch levers are disengaged. If you have a drive clutch, shift it to neutral. If you should have to walk away from your tiller for any reason, whether it be for a drink of water or to remove an object you hadn't previously noticed, disengage and shut down your tiller. Never leave it running when you're not at the controls. This is for your own safety and the safety of anyone else who may come across it while you're away. Furthermore, never try cleaning debris from the tines or making any adjustments to the unit while it's running. Always shut down the tiller completely and remove the spark plug wire prior to making any adjustments or clearing the tines. Accidental startup can result in you losing fingers or worse. Only have your tiller running and engaged when you're at the controls and clear of any possible safety hazards. And if you need to turn or transport your tiller to another area, disengage the tines. Turning into someone or something with the tines engaged is extremely dangerous. When tilling, it's advisable to steer clear of fences, structures, driveways, and utility lines or pipes. If, for any reason, you must till close to a fence or other structure, be cautious. 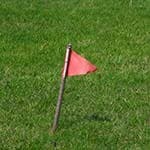 Have your utility lines marked with flags or paint so you know where to avoid tilling. 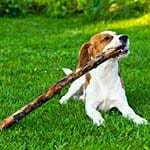 Aside from the risk of injury associated with striking a fence or structure with your tines, you don't want to cause property damage either. And if you hit a utility line, whether it be an electrical line or a gas line, you risk serious injury and loss of utilities. No matter where you live, there should be a service available for marking your underground utility lines. Whether you call 811 or another service line, be sure you have your underground utility lines marked prior to tilling. This will save you a lot of stress. No matter how productive you wish to be, don't overload your tiller's engine. Let it do the majority of the work, but don't put too much strain on it either. Digging too deep, trying to move the tiller forward too quickly, or trying to force it through a tough spot can be damaging to your tiller. If you run into a hard spot, it could be a large rock buried in the ground. Don't force it. Back up, disengage, and dig around that spot with a spade to find out what's causing the restriction. Also, there's no need to force your tiller forward if it's not moving quickly. Whether your tiller is self-propelled or not, it will move itself forward at it's own pace. Non-propelled tillers will somewhat propel themselves with their tines. If you're using a non-propelled tiller with forward-rotating tines, you can let the tiller pull itself forward for the most part. Give it small nudges to keep it going, but let the tines do the work. If you have a non-propelled rear-tine tiller with counter rotating tines, you may need to push a little more to move it forward, but don't force it if it slows down or gets stuck. 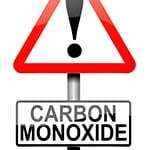 Due to the dangers of carbon monoxide, it's important to never run your tiller indoors or inside any enclosed area. This includes a garage. Running your tiller inside your garage can cause a buildup of carbon monoxide, which can be very deadly. Carbon monoxide is emitted by the exhaust system on your tiller. Even with your garage door open, the fumes can become highly concentrated because there's not enough air flow to remove it from the area. Electric cultivators do not pose this threat, because they do not use gasoline engines, but any gasoline-operated machinery should never be operated indoors. Tiller Safety and Operation Tips - Find Out How to Safely Operate a Rototiller or Cultivator. 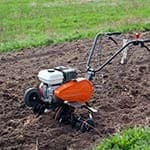 Our rototiller how-to library can help you pick the perfect electric cultivator, gas cultivator, front tine rototiller, rear tine garden tiller or garden tiller accessory.